Kevin Love is a human male adult. He is currently struggling to believe in the concept of basketball. One reason he might not understand how to do his own basketball skills is because he is in too many taco commercials. 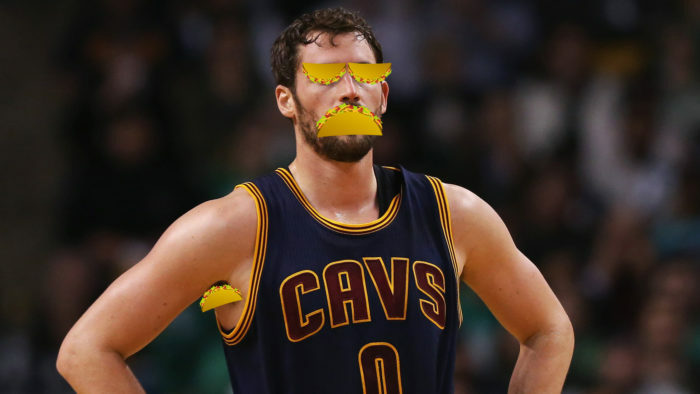 I would like to see Kevin Love do so many taco commercials the president of Cleveland sells him for a very cheap automobile. Or maybe they can sell him to the Boston Celtics for a second round draft pick. If Kevin Love was on a different team maybe he would become a different human male adult and stop questioning his own belief in the concept of basketball. I think Brad Stevens would like to teach Kevin Love how to regain basketball skills. It would also be neat if Kevin Love and Danny Ainge were in a chipotle commercial together. Danny Ainge loves eating at Chipotle which is kind of sad. He’s already had one heart attack and sources say he eats two double chicken burritos a day. Be careful Danny. In other news, did you know Orson Scott Card once wrote a biography of Danny Ainge? Maybe George RR Martin can write a biography on Kevin Love.